The National Community of Practice for Supporting Families of Individuals with Intellectual & Developmental Disabilities involves working with several states to develop systems of support for families throughout the lifespan of their family member with intellectual and developmental disabilities (I/DD). The Supporting Families project is operated under a five year grant awarded to NASDDDS by the Administration on Intellectual and Developmental Disabilities (AIDD) beginning October 2012. Grant partners include University of Missouri Kansas City-Institute on Human Development (UMKC-IHD), Human Services Research Institute (HSRI) and the National Association of State Directors of Developmental Disabilities Services (NASDDDS). Families are the core unit in our society, serving as a source of support for all its members. For people with intellectual and developmental disabilities (I/DD) the role of family is unique, and often central in the support and care provided across the lifespan. Family members play key roles in identifying and securing opportunities for their family members to participate within their community in meaningful ways and ensuring access to self-determined lives. Parents and other family members of people with I/DD often provide medical, behavioral, financial, and other daily supports beyond what most families provide. Yet, the vital role of families is not fully recognized and supported in disability policy and practice. Today, there are more than 4.7 million American citizens with an intellectual or developmental disability. Most, 75%, of these individuals live in their communities without any formal disability services. They rely on their families for varying levels of support to have the lives they want to have. Of the 25% that are receiving services, over half live with their families, and in some state, that number is as high as 80%. In 2011, a group of national and state leaders in the disability field came together at Wingspread Conference Center to provide direction and guidance for the shift to focus on families. One of the recommendation was to develop and fund a National Supporting the Family Initiative. The initiative is to gain consensus on issues related to supporting families at both the national and state level, that would inform practices and identify policies for advancing family supports. This initiative would also focus on working together to further define and build collaborations within and outside the disability system for supporting families across the lifespan, ensuring that community integration is the standard of all the work. This initiative is our Community of Practice. To build capacity through a community of practice across and within States to create policies, practices and systems to better assist and support families than include a member with I/DD across the lifespan. State and national consensus on a national framework and agenda for improving support for families with members with I/DD. Enhanced national and state policies, practices, and sustainable systems that result in improved supports to families. Enhanced capacity of states to replicate and sustain exemplary practices to support families and systems. The CoP uses a framework for systems change adapted from the State Employment Leadership Network (SELN) (see below). The outcome of systems change is supports that help individuals and families achieve a good quality of life. Systems change is driven by innovations in supports offered to families, changes in infrastructure that make it more effective and flexible, and partnerships with organizations and the community. Family and self-advocate voices, values, and leadership are the catalysts that add fuel to the fire and make systems change more personal. Finally, all of this change is happening under the umbrella of the LifeCourse framework, which promotes the idea that all people have the right to live, love, work, play and pursue their life aspirations in the community. 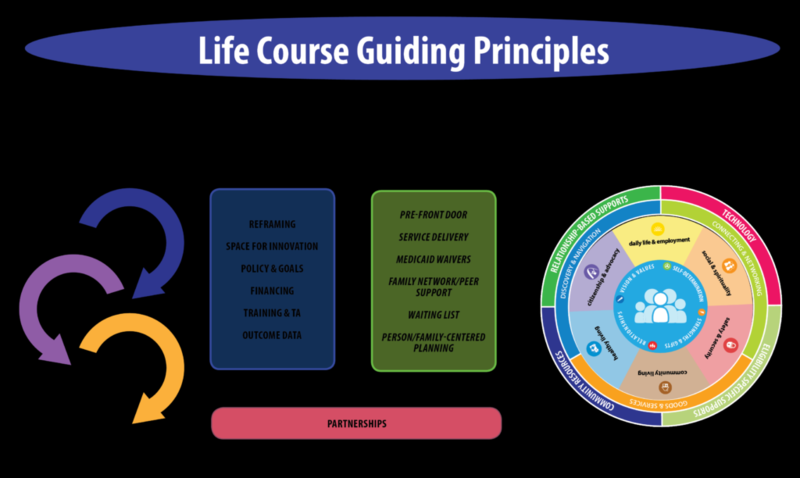 Learn more about the LifeCourse framework here. The service delivery system for people with disabilities has a history of discrimination and segregation, denying access to many opportunities for individuals with I/DD. Based on this historical discrimination, a change in the culture is necessary for system reform. As societal perception changes about people with disabilities so must the systems and policies designed to support them. The main catalyst for this change is listening to the self-advocate and family voice. Secondary catalysts include leadership and the value that segregation and discrimination is no longer acceptable. These catalysts nudge the system towards change. The key to system reform is systems efficiency. Disability service systems, through both state and federal programs, furnish a wide array of services and supports to individuals with I/DD. These services and supports provide opportunities for individuals with I/DD to maximize their full potential and participate in their families and community. The state disability system must drive forward innovative services, such as family specific strategies and family- and person- driven services. Another consideration for system reform is the fact that the new system must effectively facilitate collaboration and use of community assets. There are three strategies in family support that emphasize collaboration and use of current assets the family and community possess, these strategies are: discovery and navigation, connecting and networking, and goods and services. The interplay of all these aspects come together in the community, and form the outcome of supporting families with a member with a disability across the life course. As states continue to further their understanding of the framework and implement actions, policies and practices, there are common topics that have emerged that states would like to delve into more deeply. Over the past five years, the themes that have commonly reoccurred when looking at improving supports to families. The Supporting Families Community of Practice launched Innovation Workgroups in 2016 that are focused on these themes, where state team members are working with the national content experts and partner states to learn, share, and shape promising practices. These workgroups are closed to the public, but we look forward to sharing the learning and outcomes of the groups. The Community of Practice is looking at how states are addressing (or could address) support coordination practices through ISP templates and processes as well as policies and standards and how to foster needed changes through the lens of the LifeCourse. The CoP Planning & Support Coordination Innovations Workgroup will have conversations around expanding and developing on LifeCourse support coordination practices to increase the system’s ability to support families’ and individual’s trajectory toward the good life are the focus of this innovation area. The CoP is exploring how state developmental disability agencies are changing (or could change) the interactions, conversations, forms, processes, and practices that intake workers have with families when they first touch the formal service system. From jargon-free information, streamlining forms, addressing immediate needs and giving information/ideas based on the LifeCourse framework, the project has been exploring positive strategies that not only look at eligibility based services but also those that assist families to look at their own personal strengths, relationships and resources, technology, as well as resources available to all community members. The purpose of the CoP Front Door to Supports Innovations Workgroup is to work across states in rethinking, redesigning and implementing changes to the first interaction families have at the Front-Door of agencies when reaching out to the formal service systems, including long term service and share what states have done and brainstorm what can be done to change the Front Door conversations from solely a discussion of the service system to also provide families information, bridges to connect with other families, community networks, and other strategies that focus on hopeful and positive futures. The CoP has been looking at family engagement, networks and leadership strategies and structures currently in place, growing, or in the planning process across CoP states. The project has been exploring successful practices such as strong connections with Family to Family and related groups,mapping those connections and creating capacity to enroll statewide family leaders, creating a statewide network of peer to peer support with mentorship and family navigation, different opportunities for the networks to support the family as well as the family member, and being intentional on how families can help shape meaningful policies and programs. The purpose of the CoP Family Engagement & Networks Innovations Workgroup is to provide a platform for states to strengthen practices and opportunities in the connecting and networking bucket of support. Through the development and sustainability of family and self-advocacy networks, CoPs heighten the mental health and self-efficacy of families and provide a springboard for families to advocate for needed and desired changes on the trajectory to a good life, and opportunities to represent the family perspective at a systems level. The CoP has been taking a close look at how states are innovating (or could further innovate) and launching Medicaid waiver and other Medicaid authority changes, both through services and funding strategies, that include supporting families and infuse LifeCourse principles; tying the LifeCourse into states overarching strategic plans across different topical initiatives, policy and regulatory revisions; and, exploring successful strategies that comport with each state’s structure, process for change at factors such as local, state, financial, legislative and cultural context. Work will also focus on changes in federal rules and regulations and how CoP states can explore LifeCourse strategies with potential to increase compliance and satisfaction. Calls and webinars will be documented and available to members. The CoP LTSS Policies & Families Innovations Workgroup will work across CoP states in developing/aligning Medicaid waivers and other Medicaid authorities in supporting families, analyzing needed policies and recommending changes and tying the LifeCourse Framework into state’s overall system and structural transformation efforts across programs, funding and services, including furthering federal regulation implementation through implementing the LifeCourse. 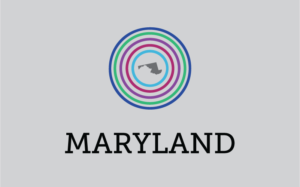 The overall purpose of the workgroup is to explore funding, policy and transformation changes that benefit families and individuals with disabilities, while assisting to achieve states’ transformation goals. The state teams in the CoP have been digging deep into the integral role family member’s play in setting the expectations and helping their family members explore the world of work and higher education. From giving young children responsibilities early on, encouraging families to dream of a successful, contributing job in the community based on experiences and interests, and encouraging planning for transition for both youth exiting high school and adult family members seeking work and careers, state teams are working to explore action steps taken, activities states are currently doing, and exploring the road ahead for employment through the LifeCourse Framework. The CoP Employment and Families Innovations Workgroup’s activities are designed to lead to practical ways to assist families, their family members with disabilities, school personnel, support coordinators and the extended relationships and resources families have to encourage and foster employment and careers for their family member. Methods to help families think early about everyday chores, responsibilities, experiences and dreams leading to a good work life; having system personnel know how to conduct and encourage these practices and looking to linkages not solely dependent on the public system will be some workgroup activities. Deeper exploration of working with families and systems on reducing barriers will be brainstormed.